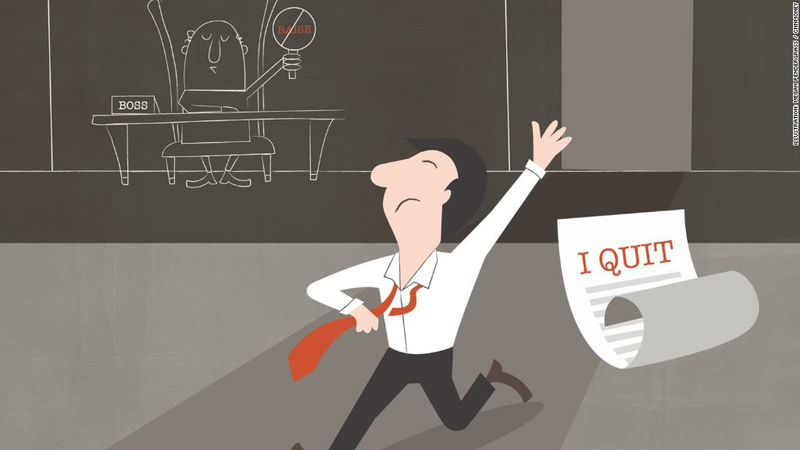 Quitting a job isn't something most people do lightly. Employers have to give them a really good reason -- or several. So what ultimately pushes someone out the door? The top three factors cited by workers in Europe, Asia and North America are minimal wage growth, a lack of advancement opportunities and excessive overtime. That's according to a new survey by EY of 9,700 full-time employees in eight of the world's largest economies: the United States, Brazil, Mexico, the United Kingdom, Germany, India, China and Japan. Also on the list: Companies or departments that don't encourage teamwork (71%); bosses who don't give employees some flexibility in when and where they work, such as telecommuting (65%); and offices where there's a sense that you'll be penalized if you opt for a flexible work schedule (67%). Call it "flexibility stigma" -- meaning that your company may offer flexible work policies on the books, but everyone fears actually using them will work against them. For instance, they worry they could be penalized by being passed over for promotion, not getting a raise or worse. Other leading factors that workers say would cause them to say "Sayonara, boss": Too much overnight business travel (62%). And more than half also said they would leave a job if there was very limited access to mentors, and when there are too few senior managers who are juggling busy family lives -- e.g., those who have kids or those who have kids and a spouse who also works.